Seeing is Believing: Is This the New Bellwether for On-Campus Art Centers? There's a reason why car salesmen want you to sign on the dotted line when you're in the dealership. The odds of conversion—or more accurately, an "impulse buy"—are particularly high. In other words, you may not have planned on buying a car when you stepped in to the dealership, but everything changed once you got behind the wheel and fell in love. This phenomenon came to mind after reading news out of Houston, where Michael Maltzan Architecture released new images of its design for the Moody Center for the Arts at Rice University. How so, you ask? Let us explain. Well, just as people know that they shouldn't impulsively buy a brand new car, arts organizations and universities should think twice before proposing incredibly expensive capital projects. Research suggests they're quite risky. But all of that logic goes out the window the minute you lay eyes on your dream car—or in this case, a dream arts center. We wouldn't fault other universities for looking at these images and feeling rather desirous. It's impressive stuff. The story begins in 2013 when the Galveston-based Moody Foundation—recently profiled here—committed $20 million for the creation of a new arts center on campus. The 50,000-square-foot center was pitched as a place to provide space for arts education, performances and gallery exhibitions curated by Rice faculty as well as jointly with museums in the greater Houston area. When Rice initially announced the grant, Caroline Levander, the university's vice provost for interdisciplinary initiatives, said that the center would "foster creativity in arts much like Rice's Oshman Engineering Design Kitchen enables creativity in engineering." Needless to say, we've devoted a lot of ink recently talking about the emerging importance of the on-campus arts center. And so it's nice to have visual representation of the concept in action. The center's interiors look less like performance and lecture halls and more like a downtown San Francisco start-up workspace. 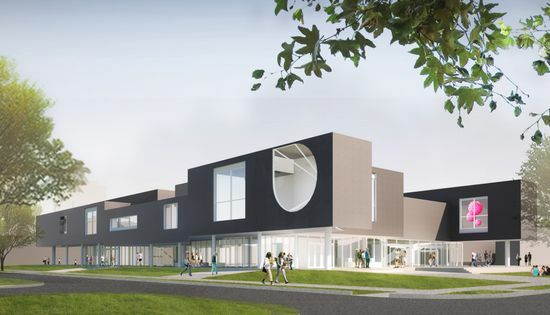 According to designers, the spaces will be centered around a "light-filled atrium containing a fully fitted maker lab, with immediate access to a wood shop, metal shop, paint booth, rapid prototyping areas, classrooms, a technology library, and AV editing booths." The takeaway here is simple. If universities and organizations wish to take the plunge and buy that fancy new "car," creating a structure solely for performance spaces won't do. Donors want more. The process of creativity must entail collaboration, immersion, and yes, even cutting-edge technology. In the case of Rice University and the Moody Center, we're looking at a "multi-disciplinary lab for creativity, which will contain 'an experimental platform for creating and presenting works in all disciplines' as well as a flexible teaching space and a forum to host partnerships with visiting national and international artists." The release of center's images coincide with Rice's announcement that the building will open to the public on February 24, 2017. And in related news, check out our analysis on how the avalanche of philanthropic dollars has helped to sustain the purported "Texas Miracle."